I recently received superdrug vochers so I decided to purchase some hair products! First the Fudge urban texture blaster which was on offer so I thought it was the perfect time to try it out this is supposed to add texture to your hair which is what everyone wants! Personally I don't feel that this product was as good as it seems as it left my hair feeling slightly like straw which is never a good look, it did add texture to my hair and left it looking natural but personally I wouldn't purchase again. 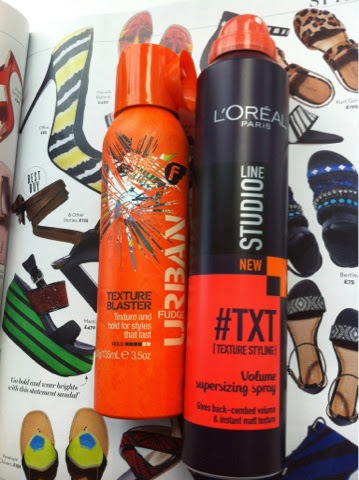 Next it the L'oreal volume super sizing spray which has been massively raved about! I love this product you only need to spray a small ammount of product and it gives amazing texture! It does exuactly what it says gives a back combed look without as much damage to the hair.